Another town, known to have been a destination for sampietresi, was Pocatello, ID. We know that Prospero Frazzini opened a branch of his Italian-American Bank there. Hello from a shirt-tail relative! I was checking the internet for some information about the current state of the "ancestral village" of San Pietro and saw a link to the Ely Cemetery website you created. It was great to take a walk down memory lane to see your pictures of the headstones. My family traveled to Ely several times when I was younger and I spent many hours at Aunt Rosie's (Uncle Al was dead) eating huge meals and visiting with Dorothy's 2 kids and with Marion Diullo and his wife Zelda. Domenic LaBate's sister is still alive--her last name is Kusmeric--and she has moved from Nevada after a hideous accident which cost her both legs. My grandmother Dorantina Rossi Colaianni was the sister of Rosina Rossi Diullo, wife of Albert. 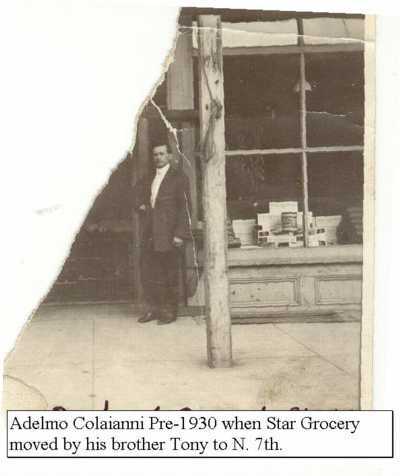 Grandma and her fiancé, Adelmo Colaianni left San Pietro, traveled to Denver to visit a cousin, (Cinea family), went to Pike's Peak where grandpa worked in the mines, then finally came to Pocatello, Idaho, to work in the Star Grocery owned by his father and his brother Antonio Colaianni. Antonio and Adelmo's sister Josephine stayed in Youngstown and married a LaBate. 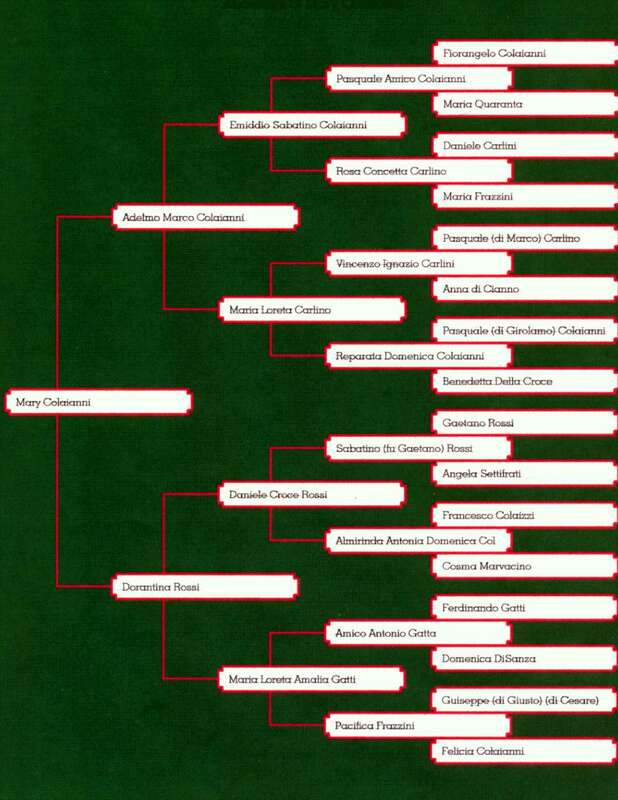 My mother's oldest sister, Mary, has done some genealogical research and has a "minimalist" family tree for Grandma (Rossi) Colaianni's side. I'll try to get a decent digital photo of it and email it to you if you're interested. She also has photo albums with some fun old pix of the older Italian relatives -- and one of the ones from Shirley that you show looks familiar to me. Must get a couple of things finished before I leave work. Send me a reply if you'd like to have the photo of the family tree (doesn't show kids, just husbands and wives). As you may have read, Filiberto (Albert) and Rosina were somehow very good friends with my grandfather, Emiliano Frazzini. I had a chance to look at Filiberto's photo album (in the possession right now of their grandson Dennis Diullo). In that album were photos of my family from 1917 to 1945. Photos that members of my family either never saw or don't remember. I have many of those photos of my family on the web site. Rosina is related to me. And here, you are related to Rosina. Do you know Dennis? He would be a cousin of some sort. When my wife and I were in Reno a month ago, we met Marion and Dorothy's brother, Gene and in Ely a couple of months ago, we met Dorothy. I believe that Marion now lives in Las Vegas. I am always interested in any information about the countrymen from San Pietro Avellana. For the web site, I'd be interested in any photos that you think might be of interest to others. A quick look at the 1920 census shows Antonio Colaianni, Dorantina, 5 children, brother Tini(?) and father Emidio. I can email you this census sheet if you haven't seen it. If you have time, I'd love to hear more about your family. I do know Dennis, his 2 brothers, and his father Gene and mother Lena. They visited my folks and we visited them many years ago, also. I haven't talked to Lena for about a year. The woman I call "Aunt Rosie" was my mother's aunt because she was the sister of Mom's mother Dorantina, so she's a direct relative of mine, while Uncle Albert was an "in-law." Rosie's younger son, Mom's cousin Marion, lives in Overton, Nevada, just a bit outside of Las Vegas. Uncle Dean, another of my grandmother Dorantina's children, lived in Las Vegas until April when he died. He actually lived with Uncle Albert and Aunt Rosie in Ely for his high school years so was very closely connected to Gene and Marion and Dorothy. 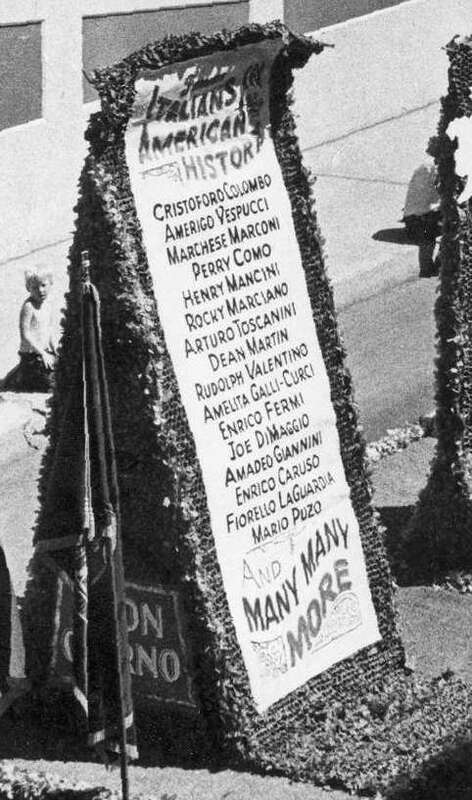 I forgot to tell you that there's one piece of info on the children of Daniele and Maria Rossi that needs to be altered: the name of the one child is a male, Domenico, not Domenica, and he was the father of Rina, Licia, and Mimo Rossi, all of whom, except great-uncle Dom, are still alive and living in Rome or Campobasso. I can provide you with some birth dates of Dorantina and Adelmo's children, too, to round out your info. The Mary Lacy referred to in your charts is the oldest child of Dorantina Rossi and Adelmo Colaianni, and is my mother's sister. Mary is still alive at 92, but is in early stages of senile dementia so her memory is very unreliable but I have her photograph albums. Aren't those old photos awesome! My grandmother Dorantina and her husband Adelmo lived in Pocatello, Idaho, on North 12th with Adelmo's brother, Antonio (who was always called Tony and is probably mis-listed as "Tini") and Adelmo's father, my great-grandfather Emidio Colaianni, and their children. In 1920, the kids would have been Gene, Mary, Dean, Viola (my mother) and Albert. Ray and Virginia, the last 2 children were born after 1920. All but Mary and Ray are deceased. I'd love to see the census sheet! I know next to nothing about tracing family history, how to interpret family trees, etc., but I've become really interested in family history lately--a bit late since my aunts and uncles have died or have failing memories, and was very excited to see what you've done. One thing that has me puzzled is that there seems to be a record of "Colaianni" being spelled with a "j"--there's no "j" in the Italian alphabet, so it's likely that the "j" is a misreading of someone's handwriting, don't you think? My mother, for instance, was actually named ElsaIola but the Americans couldn't read Grandma's continental letters so was called Elsie Viola, much to her chagrin because Borden's milk used to have advertisements featuring Elsie the contented cow! I'd love to hear how you got to SPA, etc. and share some more info with you. Also, I discovered last night that I can take the family tree paperwork that Aunt Mary did out of its frame fairly easily, so can scan it and send it to you. It will be interesting to see if spellings match up, etc. Great information. I entered your data into my family tree program and according to the program: "Rayna Valentine and Mark Camillo DiVecchio are 4th cousins.Their common ancestors are Giuseppe Giulio Frazzino and Felicia Colajanni"
Not that shirt-tail after all. Interesting to hear about Mary Lacy. Do you know Ellie Ferrero? I don't remember right off how they are related. Attached is the census sheet. I understand that "A. Colaianni" is really Adelmo, not Antonio as I mentioned in my last email. I'm sure the 'Tini' is Tony. Your mother's name is written in the census pretty much like a short version of her Italian name. As for the 'j', it was really a 'j'. In the records from SPA, the 'j' was the common spelling through the late 1800's. Then over a period of time, it changed to 'i'. Even today, both are used. I have a cousin in Roma and his last name uses the 'j' yet his brother uses the 'i'. He told me that when their births were registered, one person wrote down 'j' and another person wrote down 'i'. Spelling is something that does not exist in Italian. My father told me that they didn't teach spelling when he went to school. In Italian, you pronounce every letter (almost always) exactly as its spelled. This led to some odd variations of names and other words. If the person hearing your name, mis-heard it slightly, it got written down wrong. So I've learned to ignore spelling of names. 'i' and 'j' are interchangeable. Vowels on the ends of names changed all the time, in my case Frazzino became Frazzini and Carlino became Carlini. But for sure, the hand writing is VERY VERY hard to read. On the links page on my web site, there is a link to a page that someone did showing examples of each letter of the alphabet written by an Italian hand. You could also stay in Castel di Sangro which is a larger town about 4 miles away. We rented a car and drove from Roma to SPA. About a 3 hour drive. Driving in Italy is not as bad as they say. Driving in Roma IS pretty bad. We rented a car and picked it up at the Roma train station a 9AM on Sunday morning and then drove to the hotel, got our bags and drove directly OUT of town. On the autostrata and country roads around SPA, driving is a pleasure. Coming back to Roma, we planned on arriving about 2PM in the middle of the 'resting' time so the streets were pretty empty. There is train service to SPA but I don't know anything about it. Please do send the scan of the tree if you can. If possible scan it at 300dpi and save it as a GIF or TIF file. That would be best for for written text. If you have any photos of SPA or even people from SPA, I would really like those as well. If its ok with you, I might use them on the web site. If you can scan those at 300dpi and save them as JPG files. (Boy, I am really a pain, aren't I?). On my web page there is a "hints" page about what to do if you want to do more research. I just found a reference that Antonio Colaianni, another son of Emmidio (the one who lived past 100 and was a bachelor) worked for the Frazzini Brothers store before he moved to Pocatello and started his own market. The SPA folks kept their connections after moving to the US, didn't they? Aunt Mary died earlier this evening, we'd been expecting it for a couple of days. We'll be moving some more of her things in a week or so and I'll look for her address book. Might find some relatives of the people who can contact you in there. Who knows? Makes us feel bad, but her mind wasn't clear any longer and she missed my mother and her other sister, as well as her husband. So now my cousins and I have become "the older generation." My Valentine (Roppo Valente) grandparents Gaetano and Rosina had Nick (born in Italy), my Dad, Anton A., Bill, and Warren, and one daughter Frances. Their family and friends indiscriminately refer to the girls by both maiden and married names, regardless of the dates, so I might even have mislabeled photos because old habits die hard. Grandpa "Guy", as his name was anglicized, came from Calabria, Aiello, Cosenzo specifically, arriving in 1907 via Ellis Island. The Valentine name has a story behind it, too. There was another Valente (or Valenti) family in town, the patriarch of which was not liked by Grandpa Guy. We were told when kids that, for business reasons, Grandpa had the "in" inserted in his name to make it distinctive and distinguish him from the other family. Grandpa's brother Antonio (the other "Tony Valentine" besides my dad) who owned a barber shop in town, also changed his name to Valentine. For many years we were the only Valentine family in town. Pretty handy because any of our friends who didn't know our home phone numbers could just pick a Valentine in the phone book and whoever answered would know how to reach any of us. Anyway, my uncles are deceased now except for Uncle Bill (on Drake Avenue)and his son Tom. My brother lives in Miami, and the rest of the children were girls, who, except for me, did not retain their maiden names. My phone number is listed under my husband Harold Wilkes' name. So, now only 2 of the Valentines in the Pocatello area phonebook are related to me; the others are "immigrants." In Apr of 2006, Rayna and her cousin scanned 42 photo albums owned by her late aunt Mary Colaianni Lacy. Rayna sent me a few of the scans. I've had to reduce the size of some of them to keep the loading time of this web page reasonable. Larger size scans are available on request. I'd love to contribute to the album and am attaching a few photos. My cousin went through 10 of them and I took the rest --about 42, I think, not counting the postcards and newspaper clippings. We sorted a bunch of them for scanning and put the rest into a cardboard box which we'll divide up among the cousins. I've got about 400 scanned, I think, and have about 100 to go. We have included documents such as naturalization certificates, some wedding announcements, etc. It's been a huge undertaking, but also a great trip down memory lane. I'm the only one of the cousins who's met the Italian family (ones who stayed in Italy) except for Grandma & Rosina's niece Rina, daughter of their brother Domenic, but I thought it was important to scan their photos for everyone, particularly since the next generation seems to be getting interested in the family. I'll forward a few other of the older photos to you if you'd like. 3. Any photo that you think is of historical significance to anyone from SPA. Maybe photos taken in Italy (churches, processions, the town square). 5. 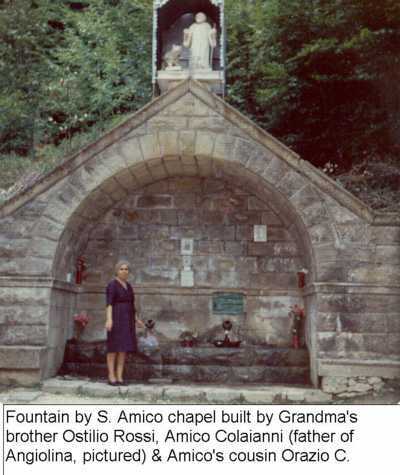 Aunt Mary - she was of the connecting generation between Italy and America. I had already started a web page about Pocatello with your emails and I'd like to add some photos. If its too much to email, you could send it on a CD. NOTE: the comments written with the photos below are from Rayna and all relative references are with respect to her (unless otherwise noted) ..
1931 Uncle Filiberto Diullo (diIullo) with brother-in-law Grandpa Adelmo Colaianni. They had seven children: Iginio "Eugene", Mary, Dean, Elsalola "Elsie Viola", Albert, Raymond, and Virginia. 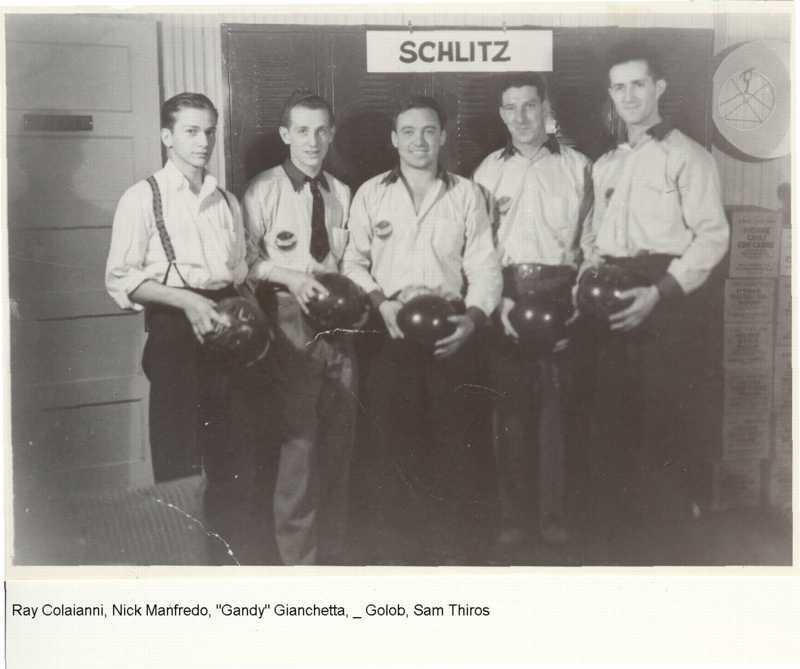 "The bocce game photo dates before 1940, and the man bending down to "bowl" is my great uncle Tony, "Unc" as everyone called him, the brother of Emiddio Colaianni, and therefore my grandfather Adelmo Colaianni's brother. He's the one who lived in Ogden and knew the Frazzinis so well--worked with them I believe, too. He owned and operated the Star Grocery in Pocatello and that's where GrandPa Adelmo and family worked, both when it was on So. 2nd in the former Castellini store and later on North 7th." For more on Giacomo "Jack" Manfredo", here is another family web site. In 2010, Rayna was asked permission to use this photo in signage for a bocce ball court in Seattle. I am a designer based in Seattle working on a signage program for a bocce ball court at public park here in Seattle. Part of this project involves a bit of background and history of the game, particularly here in the US. I found your image, "bocce game". With your permission, we would love to use it as part of the interpretive panel. Of course, credit would be given as well. Please let me know your thoughts. Thank you! Our family would be delighted to have you use the photo. The court and the tavern outside which it was located are long gone as well as all the players, but we Colaianni cousins have fond memories playing the game ourselves at family picnics on the 4th of July. I enjoyed the photos and information in your Web page. You posted a photo of your relatives playing bocce, and in the photo was one gentleman named Charlie Gates. I am a Pocatello Gates by birth! 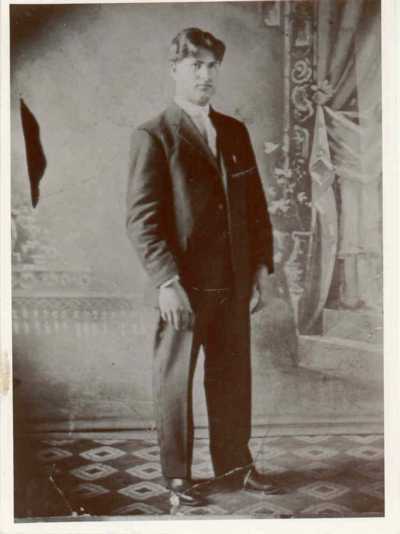 Mike Gates (Marion Michael Schiullo aka Gates) who is often referred to as one of the leaders of the Pocatello Italian group, is my great grandfather. He ran Mike's Pool Hall and several Italian restaurants in Pocatello. There is so little information though! 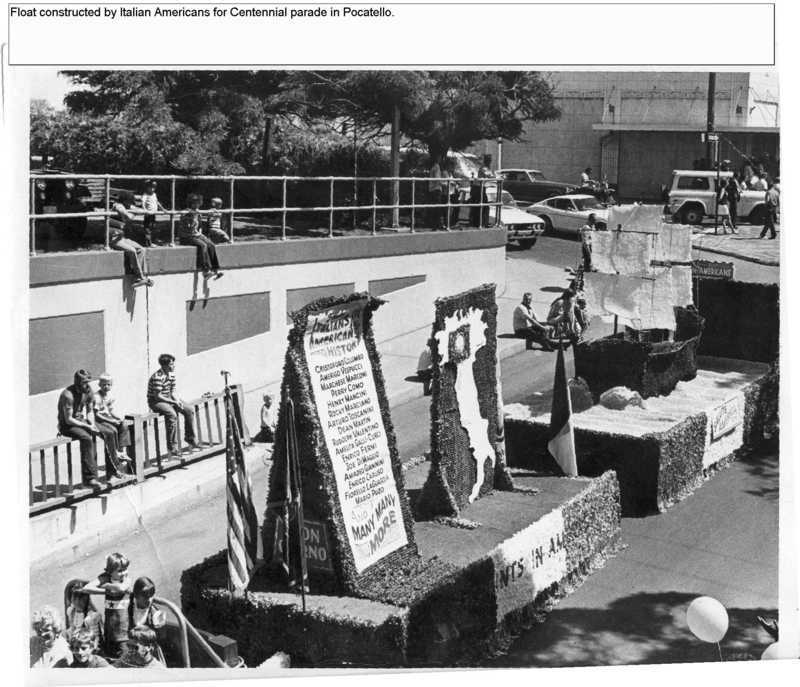 We did find a few newspaper articles (via http://chroniclingamerica.loc.gov) that mention some of his activities in Pocatello. So I was very interested when I saw a "Charlie Gates" in the photo. Perhaps a shirt tail relative of mine? 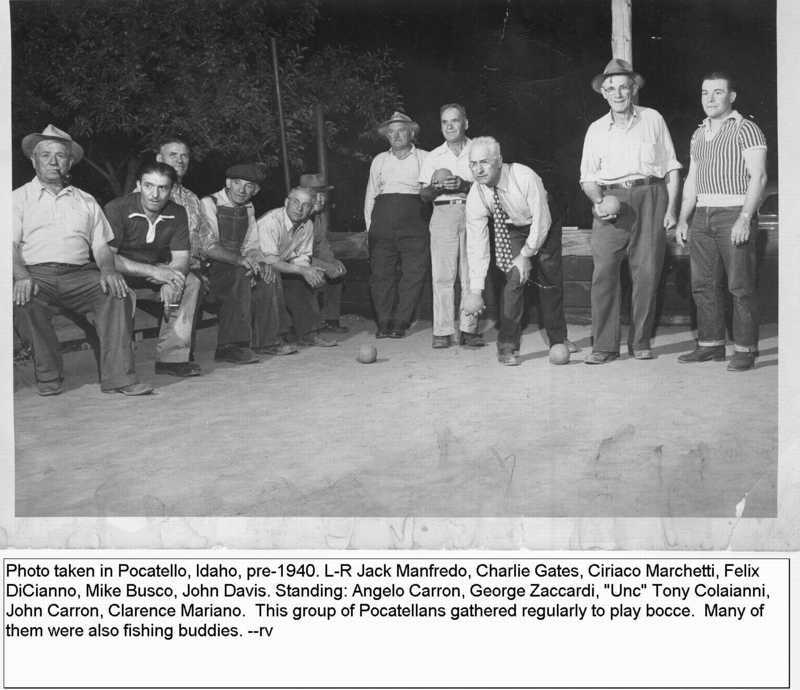 I was often told of how the men would gather once a week to play bocce at my great grandfathers. Built by Grandma's brother, Ostillo Rossi, Amico Colaianni (father of Angiolina, pictured) & Amico's cousin Orazio Colaianni. "Thanks for the info regarding birth dates. I think I may have misunderstood Ornella, between her accent, and my cell phone or the info her mother gave her about her grandmother was just plain wrong. I'll adjust my notes. I wonder if the Emiddio she was talking about was Emiddio Colaianni--my great-grandfather?? Now that I think about the birth and death dates, it makes sense. She was talking about her great aunt Clotilde and Emiddio being only a year apart -- not that they were brother/sister but that they were our respective relatives and were close in age. Great-grandpa Emidio died shortly after I was born, and since I was born in May of 1947, that also makes sense. Here's a picture of Emiddio taken ca. 1936 in Denver and one of his son, my great uncle Tony Colaianni who died just short of 101 about 15 years ago..
Emiddio Colaianni had a daughter, Concetta, who married Oreste Cinea. They moved to Denver and lived the rest of their lives there. Their daughter, Italia, was born in Italy and this is her picture--it's another of Vincenzo Gentile's with his studio stamp on the back. Oreste and Zia C had another daughter, Viola, and a son, Anthony. Only Italia married and she had no children. They operated a small grocery store out of a couple of rooms in their house in Denver for years. They also made great ricotta ravioli, which I ate with gusto when I visited them while at school in Boulder! The inscription on the back is nearly illegible because it's written with black ink on dark gray cardboard and the ink is fading, but is says "Per Il Sigr. Emidio Colaianni - Cari cari (illegible word) dalla tua cara nipotina, Italia Cinea" Aunt Mary always spelled great-gpa's name with two d's , but this inscription spells it with a single "d."
Emiddio also had a brother named Daniele about whom I know nothing except that he had a son named Fiorillo Colaianni who lived in Chicago. Fiorillo was therefore my grandfather Adelmo's cousin. We have Fiorilllo's wedding photo which he sent to grandpa Adelmo, but no information as to date or who the bride might be. I've found some references to Colaiannis in New Jersey, also, with whom my aunt corresponded. There's a huge batch of people in one photo which might have notes on the back so I'll be prying it out of the album sometime this month, too." Yes, she was the last of that family. Italia died about 2-3 years ago and I'm pretty sure that there are funeral notices in the box of Aunt Mary's that I haven't opened yet. 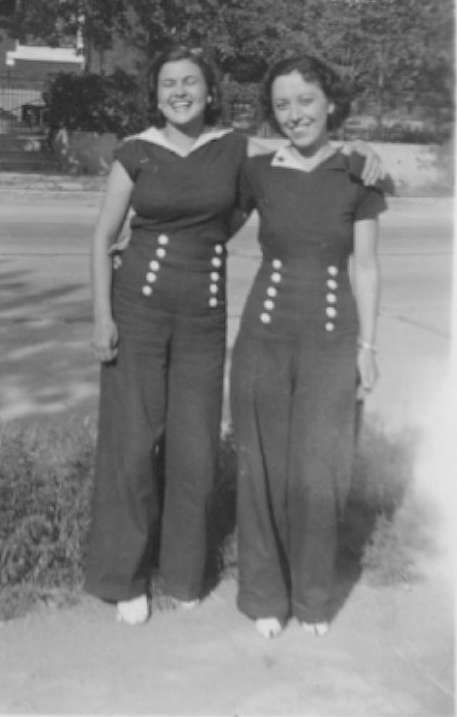 My Aunt Mary wrote and telephoned them on a regular basis until about a year and a half ago.. Elsie Alvarez was the person who took care of Vi and "I" (pronounced "ee"--the nickname by which our family called her as far back as I can remember). No relation, though. I know my aunt telephoned Elsie umpteen times and had me check into estate issues some years back when the two sisters were beginning to show signs of Alzhiemer's. Mary sent Elsie money because she was always complaining about how much it cost her to "look in on and take care of" them, but she was pretty closed-mouth about it so I don't know all the ins and outs of the brouhaha. The Concetta for whom she was named was my great-great-grandmother Rosa Concetta Carlino who married Emiddio Colaianni's father, Pasquale Amico Colaianni.Speaking of dying, Aunt Mary died earlier this evening and I saw your email while I was notifying some out-of-town relatives--we'd been expecting it for a couple of days. We'll be moving some more of her things in a week or so and I'll look for her address book. Might find some relatives of the people who contact you in there. Who knows? Makes us feel bad, but her mind wasn't clear any longer and she missed my mother and her other sister, as well as her husband. So now my cousins and I have become "the older generation." I am so sorry hear about Mary's death. Its always sad no matter what. Well, we can keep her memory alive by spreading the word about her family and all the related families from SPA. Thanks for the additional stories about Vi and I. You're right about the family stories. Sharing emails has made some buried memories of mine resurface, also. It's great fun. Thanks for the kind words. We'll miss her. "Thanks for the Ogden info--wish you'd have had time to swing up to Pocatello--it's only about 1 1/2 hours from Ogden via interstate to our house. I sent the link to your sight to my cousins in Rome--the ones I'll be visiting when they head for S. P. in August. Luciana said she couldn't believe how much information you have compared to what they have--she didn't even know the full given name of her great grandmother and said the info I sent that was compiled by my Aunt Mary was wonderful for her son--he's trying to do a family tree himself. She said that she knew our family was related to the Frazzini family through the Gatti connection, but not all the rest of it. 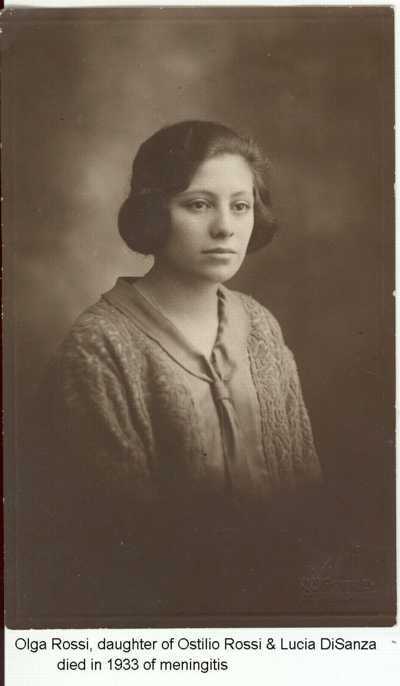 I'm sending you a photo of Luciana's grandmother, Lucia DiSanza, who was married to my great uncle Ostilio Rossi. Lucia stayed in Italy and would not go to Philadelphia where Ostilio worked. The two children, Olgo, the younger, and Emilia, both died when they were fairly young. Ostilio returned to Italy for some years and they then had the family that I knew--Italo (Luciana and Daniela's father), another Emilia and Adalbert. The second Emilia is still living, but both boys and their wives are deceased and, of course, Ostilio died many years ago and is buried in Philadelphia." Ostilio was the brother of Dorantina and Rosina. 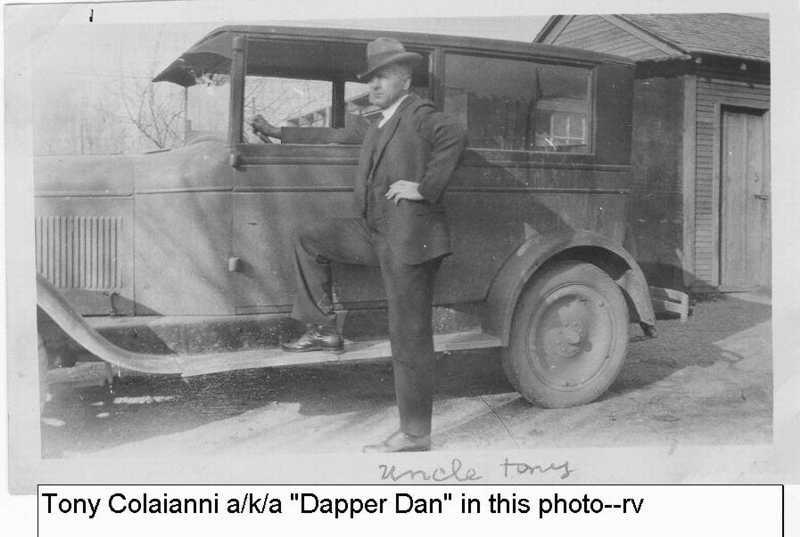 "I just found a reference that Antonio Colaianni, another son of Emmidio (the one who lived past 100 and was a bachelor) worked for the Frazzinni Brothers store before he moved to Pocatello and started his own market. The S.P. folks kept their connections after moving to the US, didn't they?" "Aunt Mary (daughter of Adelmo (called Elmer) and Dorantina Rossi Colaianni) was a note-taker and she wrote bits and pieces of things on all sorts of papers. She helped write a brief bio of Uncle Tony from an "interview" she did with him for inclusion in a book about Bannock County's 100-year old folks. The note papers as well as a copy of the biography were stuffed in a box that we're just now going through. SHe's 92 (husband died 3 months ago) and can't live at home any longer, so we're selling the house and cleaning it out. In the notes she states that "at age 1 he went to work in the Rock Springs coal mines--a mining accident at age 16 --took him to Ogden, Utah. Following his recovery he worked for Frazzini Brothers import grocery store." Now that I've reviewed this more closely it seems that the Frazzini store was in Ogden, Utah., not in Colorado as I'd earlier thought. Uncle Tony lived with his brother Adelmo and Grandma Dorantina all the time they were in Pocatello at the 750 North 12th address you see in the census record. He outlived both of them and continued living at the family home until a few months before he died. Here's more "Inf. from Uncle Oct 1989: Zia Francesca - curly hair beautiful woman had son Romero. His Dad had a horse--took wares for Cecilio Pitinello--to the sale oat Castel di Sangro. Francesca married to a Guardobasso. Clotilda - her husband Tonti was a musician. His (Uncle Tony's) teacher in S. P. Forleo Forale - from Castel Di Sangro- had a beautiful penmanship." Uncle Tony wrote a beautiful hand, by the way, and always gave credit to this teacher, but this is the first time I'd ever heard the man's name. Margaret Marchetti Sanna was a good friend of my mother (one of those 3 generation friendships--her mother and my grandmother, she and my mother, and her kids and me). She's still in town and I'll ask her about the bank and let you know." "Here's a great photo of Fiorillo Colaianni and his brother Arturo taken in Chicago in the 50's. Arturo resembles his nephew my Uncle Tony Colaianni a great deal as you can see. Fiorillo didn't age quite as well-quite a contrast in his later days to the wedding photo I sent earlier, isn't there? Anyway, I've got to check out the other notes of Aunt Mary's because I had thought she mentioned that Fiorillo was a brother of Emiddio rather than the son of a brother of his." For more photos of the Colaianni's in Chicago, click here. "The Ida Labate in our family was a woman who married one of the children of my GGP's Maria Gatti and Daniele Rossi. She married Domenico Rossi and had 3 children, Licia, who married Austero DiMartino & had 2 boys, Paolo and Oreste), Rina, unmarried, and Amico, who married Maria Rita (last name unknown) and had Sabina and Flaminia. Attached is a photo of her taken with her sister-in-law Lucia DiSanza, Dave DeSanzo's great-aunt who stayed in Italy rather than go to the US with Ostilio Rossi her husband." 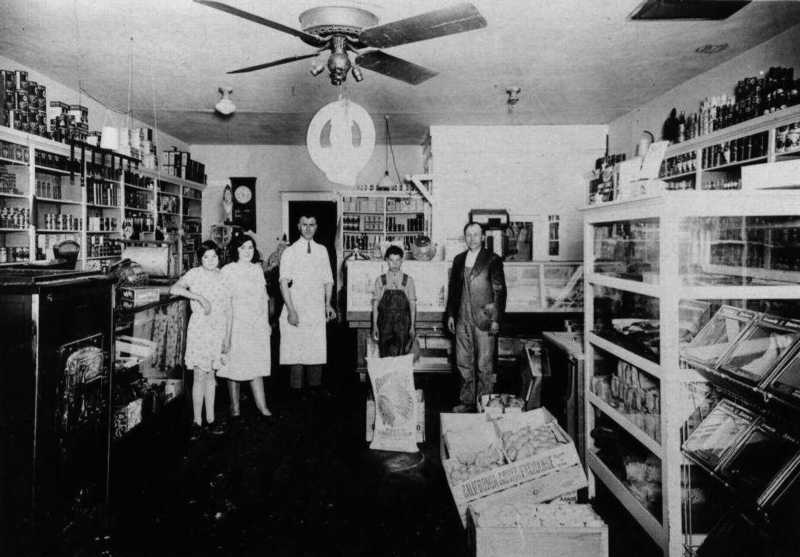 "Before Oreste started his own home grocery store (in 1926 I believe)--see attached photo--he worked for Frazzini brothers in their grocery store in Denver. Frazzinis must have had an affinity for the grocery business. My Uncle Tony Colaianni also worked for some Frazzini brothers in Ogden until he left to come to Pocatello and open his own grocery. I have a taped interview of him at age 99 talking about the older ("the old man") who was no longer interested in the business and just wanted to go to the saloon they owned and drink and visit with his cronies. The young ones relied on Unc for doing some of the book work because he was very good at math and "wrote a beautiful hand" as they say." Click here for a family tree drawing done by Mary Colaianni Lacy. Here's a wedding photo I found with, wonder of wonders, a listing of the people on the back as well as the date of the photo. 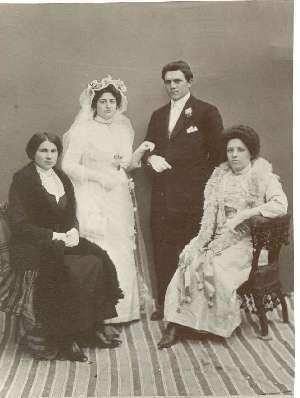 From left, Advenza Mariani, her daughter Marietta and her groom, John DiSanza, and my great aunt by marriage, Lucietta Rossi (I think she was John's sister) who was the wife of Ostillio Rossi, who was the brother of Rosina, one of Mark's direct ancestors. The photo was given to my Aunt Mary by her cousin Elsie LaBate, the daughter of Ercole LaBate, who, if I'm not mistaken, was married to Josephine, my grandfather Adelmo Colaiani's sister. The photo was dated May 27, 1914 and taken in San Pietro. I've recently been emailing a Dave DeSanzo (diSanza). His granduncle is Giovanni "John" diSanza. You sent me a scan of a wedding photo of John and Marietta. Dave was going to contact you, I'm not sure if he has yet. We are trying to determine who Marietta's parents were. On the photo, you said her mother's name was written as Advenza Mariani. Is it possible for you to scan the back of the photo? Do you know who wrote those names there? My Aunt Mary is too far gone mentally to be of any help, but she did a great deal of genealogical research and I have a box of the copies of birth certificates, etc. that she kept, which is going to be my next project after going through her boxes of photos. I might find something pertinent. I did go back through the geneology diagram and found that "our" Maria Loreta Carlino(Carlini) was the daughter of Vincenzo Ignazio Carlini and Reparata Domenica Colaianni. From the diagram which was made from the actual records, our Maria was married to Emiddio Sabatino Colaianni and one of their children was Adelmo Marco Colaianni who was my grandfather. Somewhere or other I have seen photos of Reparata's family, and if I'm lucky, there's something written on the back of them. Will keep you posted if and when I find anything. "Our" Maria Carlini was born 9/9/1859 and died in 1905, according to her great granddaughter, Ornella Atwell, who is living in California and is only about 60 years old. Maria had a sister named Clothilde, who was born 11/17/1862 and married Antonio Tonte (Tonti? 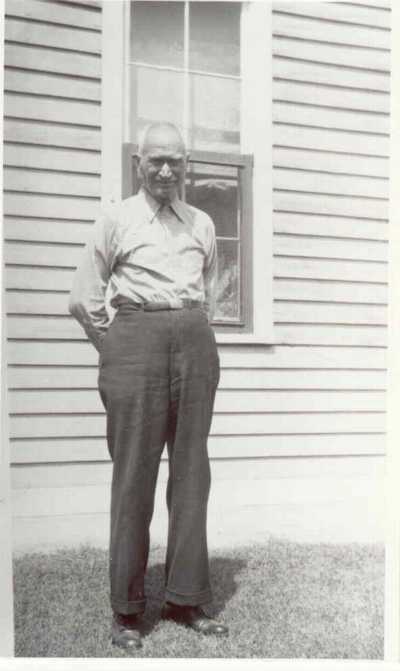 ), and a brother Emiddio born 10/3/1863 who died in 1947. Maybe your John and our John are different people? 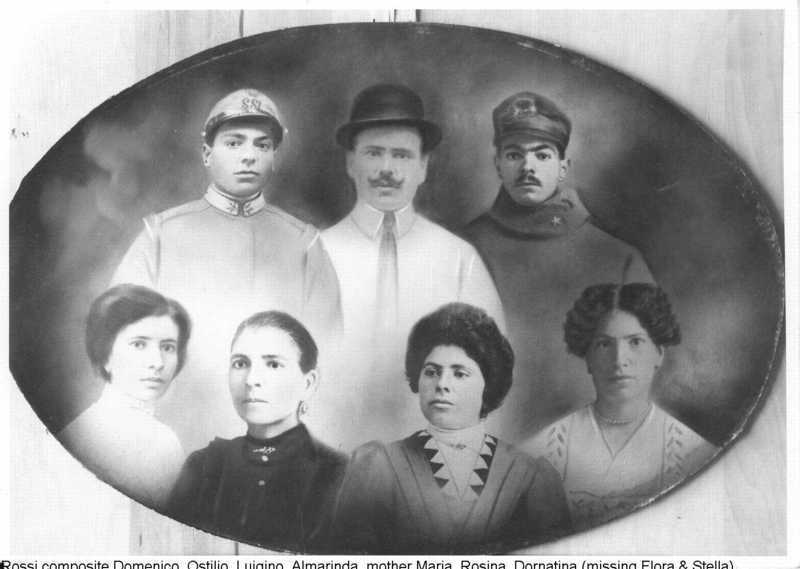 Our connection to the DiSanzas is through his sister Lucia/Lucietta (on the right in the photo) who married my grandmother (wife of the above-named Adelmo) Dorantina's brother Ostilio Rossi, who lived in Pennsylvania for years. 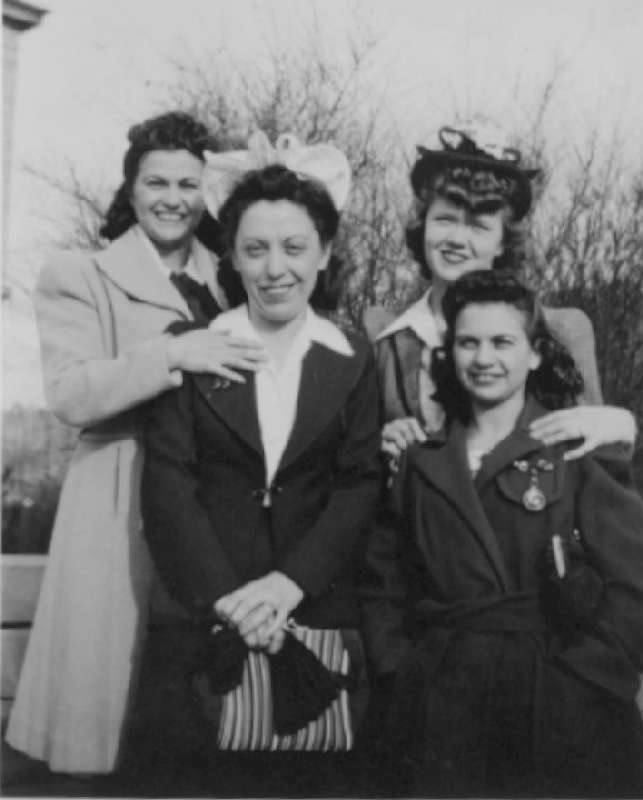 So, bottom line, I have no idea why that photo has "Advenza Mariana, daughter Marietta, John DiSanza, and his sister Lucia" as the caption which is in my aunt's hand. The back of the photo doesn't say anything beyond the names of the individuals in what may be my aunt's handwriting and the following in John's handwriting, "Ricordi e saluti dal tuo cugino, John" followed by an undecipherable initial, followed by "S.Pietro Avellana 27-5-1914." I also found a note from aunt Mary about the wedding photo ". . .original given to me by my cousin Elsie LaBate, daughter of Ercole LaBate. copied--sent it to Zia Lucietta- Italy". " I really think the caption was an error on Aunt Mary's part, because it's in more shaky handwriting and was probably done at one of the cousin's urgings to have her tell about the photos. I do remember that there were several Mariani family members who were lifelong friends of my grandparents and my uncles and that they were from the same area, so it would make sense for there to be a Mariani in the photo taken in San Pietro. From the SPA microfilms, Maria Loreta was born 8 Sep 1857. Clotilde was born 15 Nov 1862. I can't find an Emiddio at all. I'm seen alot of photos taken by Vincenzo Gentile. So, I guess I'm going through a little temporary confusion about who this John diSanza really is. Dave, I hope Della is feeling better. She can straighten us out. I found what I think is the photo sent by Ercole, which has hand-copied info on the back, some of which is probably Ercole's (see the photo I sent showing the message from cousin John and the info on the photo studio) and the people identifiication is Aunt Mary's handwriting. There is no mention on this one that Marietta, the bride of John DiSanza, was the daughter of anyone, let alone Advenza Mariani. So I think that the notation my Aunt Mary made on the other copied photo was a mistake--it's in handwriting that resembles her later hand rather than earlier and she could simply have gotten distracted and forgotten who was who. The photo came via her cousin, Ercole LaBate, who is now dead, but his son Ed who lives in Boardman, Ohio, may remember hearing about them. I might have to call and see if he's well enough to talk about the old days, let alone remember anything about all those "old folks" who were friends of his parents. That makes 3 Maria Carlinis! But my great-grandmother Maria Carlini was Maria Loreta Carlini, sister of Clothilde and Francesca, and was born in 1859. I think some of these answers may be in the box of Aunt Mary's that we haven't yet tackled. It's supposed to have birth and death records actually photocopied from originals. Guess what I'll be doing after we get back the last week of March?? Sorry if I wasn't clear. I've been muddled-head for the past week because of Aunt Mary's impending demise. Our Fiorillo was definitely a Colaianni--he was the son of great-grandpa Emiddio's brother Daniele Colaianni and was therefore a cousin of Italia, Viola and Anthony Cinea (who were the children of Concetta Colaianni (daughter of Emiddio) and Oreste Cinea). 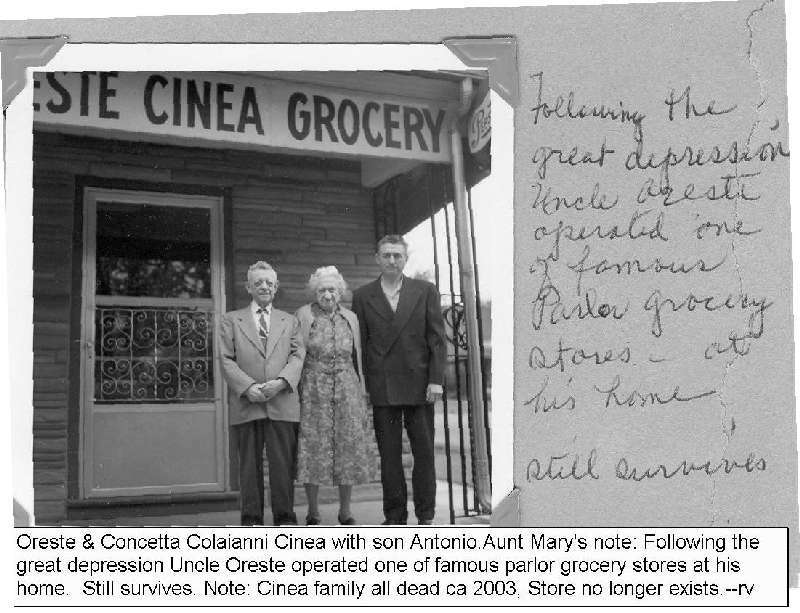 I'm not sure how much information we might have on the Cinea family, but Oreste Cinea and Concetta Ciolaianni were married in San Pietro -- Italia was born there before they came to America. A week after the funeral this Thursday, my husband and I are leaving on our trip to visit cousins and my brother, so I won't get much done in the week between the two. I will try to go through Mary's mementos and photo albums and organize them chronologically if possible. She often found older pictures while working on a new batch and just plopped them all together. Makes for great fun for browing, but it's a headache to organize! Of course - I guess that's me having a senior moment. I will go back and look around for Fiorillo Colaianni. Hope your trip after the funeral is ok. Here is another better guess at Fiorillo Colaianni. Rayna, what was Mary's husband's name? Thanks for the info on Fiorillo--seems a good probability that this is the one about whom we have notes and the one photo. My Aunt Mary's spot on the family chart will be the last for that little branch. She married Ralph E. Lacy when she was 47, in 1960, and had no children. My mother Viola's /ElsaIola) spot is likewise a "dead-end" branch because neither my brother nor myself have children. Ditto with uncle Iginio (Gene) and Albert because they both died in the early 1940's without children. So, of Dorantina and Adelmo Colaianni's children only Ray, Virginia, and Dean have children who have had children. We range in age from early 40's to 63 for the oldest. I just received a phone call from the Jim DiSanza, who moved to Pocatello about 17 years ago, because he saw the funeral notice. He said his grandmother was from San Pietro and was named Claudine and was married to Vincent (Vincenzo, I presume). He doesn't remember her maiden name, but knows that she and her husband came to the States just before the depression and lived in Ohio. She died a few years ago and he lost contact with my Aunt Mary about then, because he no longer was taking her to my Aunt's house when she visited from Ohio. Jim's daughter is in high school here in Pocatello and wants to go see San Pietro in a couple of years. Isn't it great that the interest in SP is ongoing? I think I forgot to tell you that the Ercole LaBate, the cousin to whom John sent the wedding photo, was indeed the Ercole LaBate who married great grandpa Emiddio Colaianni's daughter Guiseppina. P.S. Just got to thinking--Advenza is wearing what could be a black dress in that photo. Could she have been a widow at the time of the photo so that she wasn't a Mariani by birth? Fascinating stuf this is! Who exactly is Advenza Mariani is still confusing me. The wedding photo notation was that Advenza Mariani's daughter Marietta was the bride of John DeSanzo. In Italy, Advenza, would always have been known by her maiden name. Here in the US, she might have been known by her married name. Della remembered that John's wife was Maria Carlini. Based on an Ellis Island record, Marietta was born about 1894 and I did find a Mary Beatrice Carlini born in 1894. But that Maria's mother was Maria Domenica Labate. I'm sending you a copy of the message and attachments in case you might find them interesting. Ostilio is Rosina Rossi (Diullo's) brother and is therefore one of your relatives, too, right? 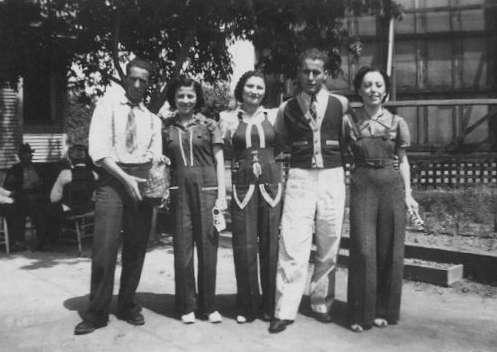 Ho ricevuto la tua risposta e trasmettoli una copia di una lettera da Ostilio alla mia nonna Dorantina, scritta in 1935, una foto di lui con la sua unità militare durante il WWI, una foto di lui con un cugino presa a Pittsburgh, e una foto della sua moglie Lucia con i loro primi 2 bambini che entrambi hanno morto prima che siano sposate. (Emilia è quello più piccolo chi è morto in primo luogo ed Olga è quello più vecchio. 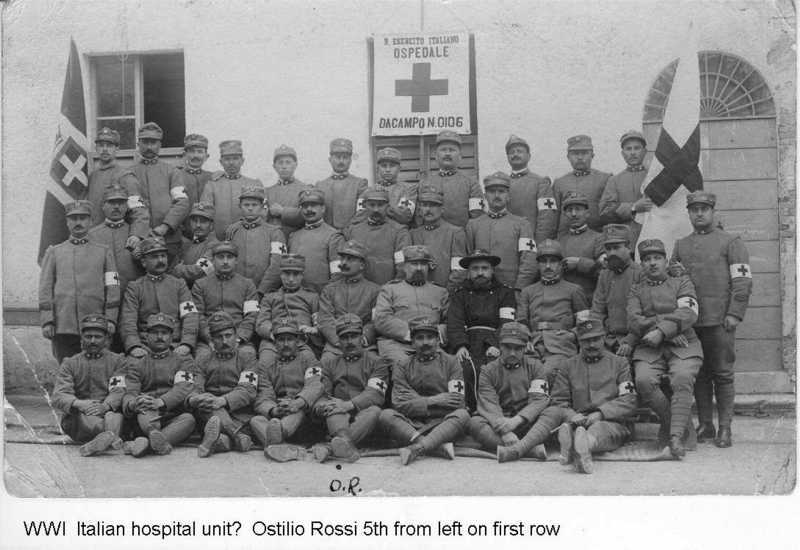 Mi diletto per ricevere la vostra risposta.Sto trasmettendoli una copia di una lettera da Ostilio alla mia nonna Dorantina, scritta in 1935, a immagine di lui con la sua unità militare durante il WWI, una foto di lui con un altro persona presa a Pittsburgh e una foto della sua moglie Lucia con i loro primi 2 bambini che entrambi hanno morto prima che siano sposate. (Emilia è quello più piccolo chi è morto in primo luogo ed Olga è quello più vecchio; è morto in 1933 (27 anni) Ho trovato anche una foto di la tomba di Ostilio con la mia nonna (senza la testa!) La mia nonna mi ha detto che Lucia non desiderasse lasciare la sua madre ed altra la famiglia e il suo povero fratello ha dovuto vivere da sè, ma io credo che ci era anche altri motivi (reasons). Ho trasmesso alcune informazione anche a Andrea, figlio di Luciana. Continuerò a cercare le foto e le informazioni e forse li vedrà in agosto per parlare della nostra famiglia di Rossi. P.S. Your English is better than my Italian, but I must practice by trying to write phrases first and then use the translation program to see if my attempts are close to correct. I make many changes! > It' s very kind to hear you again. I well remember your family and the one of Mary because my Adalberto father kept for years a correspondence with his aunts Rosina and Dorantina and his cousins. I still preserve a few pictures which were in my father's albums. > From when I have found on the Web site of Mark De Vecchio, I have spent time very much to rebuild my American relatives', family tree: the ones of my Ostilio Rossi grandfather's than of my Lucia Di Sanza grandmother. > Mark has sent my first email to you and to Dave De Sanzo and I am veryglad to have had news both from you and Dave. > I would like to ask you a kindness. Dave has written to me that your grandmother had in his album a few pictures of my Ostilio grandfather. Can you send me a copy by email? He would make me like very much because I am trying to gather all the possible information about him. I would like understanding how has spent by almost forty years in United States far from his wife and from his children. A life certainly difficult. I thank you very much. I apologize to you for my English. Mi chiamo Piero Ostilio Rossi. Sono nato nel 1948. Sono un architetto e vivo a Roma. I miei nonni sono Ostilio Rossi e Lucia Di Sanza. Entrambi sono nati a San Pietro Avellana. Digitando su Google il nome "Ostilio Rossi" ho trovato il suo bellissimo sito dove ho rintracciato molti i miei parenti emigrati negli Stati Uniti, in particolare Luigi Di Sanza (de Sanzo) e Giovanni di Sanza, fratelli di mia nonna e Rosina e Dorantina Rossi, sorelle di mio nonno. Se vuole, posso inviarle informazioni sui discendenti di Ostilio e di Lucia e alcune fotografie. Posso scriverle in italiano o preferisce in inglese? Facoltà di Architettura "Ludovico Quaroni" dell'Università di Roma "La Sapienza"
My Italian is not very good but I understood your email. Can you write in English? I have sent your email to your cousins, Dave DeSanzo (descendent from Luigi diSanza) and Rayna Colaianni Valentine (descendent from Dorantina Rossi). Just remembered you mentioned Elli Ferrero. I found a reference to a photo of Erminio Gatti, who was Grandma Dorantina Colaianni's cousin, with his daughter Mary Ferrero. 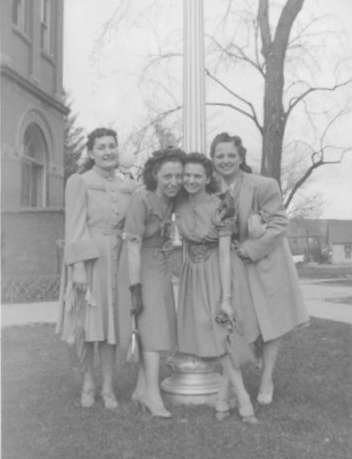 When I find the photo, I'll send it on to you--from the '50's I believe. Mary, by the way, still lives in Salt Lake. I spoke to her last week about my aunt's funeral. She's had a stroke, but is doing quite well so I might be able to get some additional information about the sampietresi from her. I had communcated a bit with Elle a few years ago. I am happy to hear that she is doing well after the stroke. Hope you get a chance to talk with her.